Writing, playing and performing music is like asking yourself a perpetual list of unanswered questions. When I answer one it just throws up a hundred more. But I won't stop asking these questions, I'll just stop trying to answer them. After playing with Marc Romboy at the Om event at Sonar, he asked me to do this DJ mix for his Systematic Sessions Show. Oh and the last track is "TR Love" which he signed for his 5 years Systematic release. Here's a DJ mix I did for the Kreuzberg Institut podcast series. It's 2 hours long - the first hour is from the legendary (and very lovely) Hipp-e, I start about 60 mins in. This is a low quality mp3, if you want the whole shebang you can get it here from Beatport. I wrote it for Marc Romboy at Systematic who asked me to do a track for his 5 Years Systematic anniversary release. Here's another edit/bootleg I did recently. Luke Solomon from Classic asked me to remix one of my favourites from the Classic catalogue and I picked 3rd Face "Canto Della Liberta". One of the things I've incorporated into my live set is music from elsewhere that has truly inspired me. But I've tried not to just play the original track as a DJ would, but instead attempted to do "live" remixes of said music. It is completely unofficial so if you like it please support the brilliant, wonderful, marvellous Animal Collective and buy their album or if you can't stretch to that, then at least the track "My Girls". "ace! 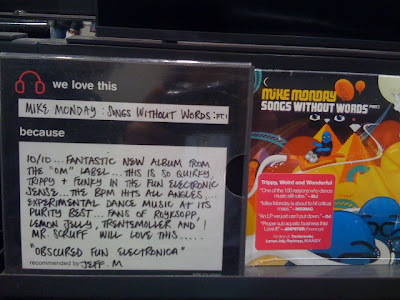 played it at the arches"
"really really good man! played it out twice already." really liking that line you have taken....super good... MANDY played it in Romania the other day, and i almost fell over..."
"yea man, just dropped your "my girls" boot at this street faire fest here in SF and the crowd went mental"
It's quite a bit deeper than the Comes Down one and gets pretty intense towards the end. Maybe I was in a bad mood that day. Thought I'd post a couple of my recent DJ mixes, (although they're not that recent now - doesn't time fly?) and continue to do so from now on as and when I do them. Oh and I've also got a few live sets I've recorded both in my studio and at gigs that I'll be posting in the coming weeks. Mike Monday vs 3rd Face - What Canto Is It? The hubris of my last post is worthy of a Greek tragedy. After reading the frankly hilarious Catnip video reviews on iTunes US, I have started to wonder whether I really meant what I said. How could anyone get so angry about something as harmless and fun as Catnip? I can't help but think that the more vitriolic reviews say more about the reviewer than the video itself. But all this did set me thinking. Don't the reviews make for an interesting snapshot of America? They could even be seen as a microcosm of a completely polarised country evinced in the November 4th presidential election (which is also my birthday weirdly enough). I'm not suggesting that everyone who got hot under the collar is a McCain supporter, or that all the wonderful and beautiful people who valiantly defended my work are Obamaheads, after all many of the reviewers are probably not old enough to vote. But the reaction to Catnip has shown in an unusual and unexpected way 2 sides of an amazing and bewildering country, and make me realise why I both love and fear the United States. I spend a fair amount of time there, and literally everyone I have encountered in any meaningful way is both open minded and intelligent. I think Stephen Fry puts it excellently in his podcast (Episode 2 - Bored Of The Dance) where he rails against the rampant anti Americanism that is rife here in Europe. Especially the ridiculous and offensive idea that Americans have no sense of irony. But whilst in the US, I do spend all my time in the cities, particularly San Francisco, which I know can't be viewed as representative. But can any single place or point of view be representative of such a multi-faceted country, especially one as divided as the USA? "You can't please all of the people all of the time, or please some of the people all of the time or even please all of the people some of the time. You can however please yourself." As someone who's been writing and releasing music for nearly 14 years (crikey! ), these are exciting times indeed. Not particularly good times, but most definitely exciting. The way that music is now distributed has fundamentally changed and there are many unforseen consequences and opportunities as a result of this seismic shift, some good some bad. The digital behemoth that is iTunes is too often seen as simply a necessary evil by artists and labels, but given that someone was going to do it, I am broadly pretty positive about the way iTunes operates. I'm not going to rehearse the familiar arguments about how much they pay the artists/labels for the music, how they are a virtual monopoly on digital music, or about how they're hastening the end of the album as a format for releasing music. 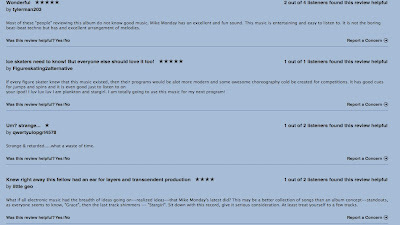 But in my experience so far they have a healthy regard for music which isn't necessarily the most commercial (my music video Catnip has been chosen as the music video of the week for the front page of iTunes US and available for a free download - plug plug), and what's more on a personal level its the details about the site that I'm starting to dig. 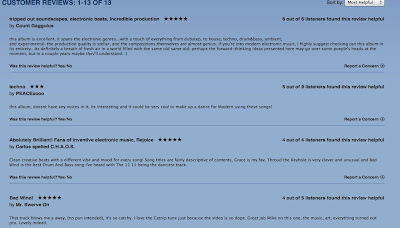 The user reviews are something both frightening and exhilarating for me as an artist, as until now no one has really been able to tell me what the genuine punter - who isn't my mum - thinks about my work. 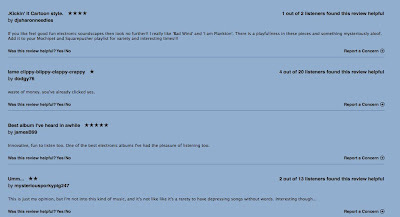 Journo reviews are one thing, but reading these early customer reviews of Songs Without Words on iTunes USA (I particularly love the "strange and retarded" one - isn't that a compliment?) has given me an invaluable insight into what Joe Plumber thinks of my work. This can only be a good thing for me as an artist. Ok, user reviews are not just as iTunes idea, but the way they are so front and centre of the iTunes shopping experience is excellent. Power to the people! Or to Steve Jobs! Or just maybe both. If you want to see whether you agree with HMV you check it on iTunes here! The second part of my Catnip cartoon is now up exclusively on Beatportal! I've put up my Kyte TV channel in the sidebar. If you want to see what's been going on in Mondayworld, I'll be regularly updating it with video of my travels, studio sessions and other random bits and pieces. And if you click the "Get And Share" button you can embed it into wherever you want, and it will automatically update the player with the new shows as they come up. taken from the forthcoming album on Om Records "Songs Without Words pt 1"
Whilst cleaning the house this morning, I decided to get a much needed musical fix from Andrew Weatherall. I'm a big fan of the Get The Curse podcasts, as they get some great DJ mixes up, but this was the first time I'd had a chance to listen to the Andrew Weatherall - Rotters Golf Club one from early June. When I was putting some serious elbow grease into waxing my kitchen table, at about 27mins in I was pleasantly surprised to hear a recent remix I did of Falko Brocksieper's 'Lament' come in. So I now have an opportunity to start this blog, which I hope will give an insight into what makes someone who writes and performs their own tunes tick. I'll be posting new tracks, videos, mixes as well as taking a camera on the road with me to put up anything that I find interesting, annoying or ridiculous.